Disney Movie Rewards launched The Little Mermaid Adventure at Sea Sweepstakes today to coincide with the October 1, 2013 blu-ray Diamond Edition release of The Little Mermaid which is currently available to preorder. One grand prize winner will receive a 4-Night Bahamian Cruise aboard the Disney Dream for up to four guests. The grand prize will include round trip airfare (or reimbursement for ground transportation if the winner lives within 200 miles of Orlando), and ground transportation to Port Canaveral. The estimated retail value for this cruise is around $7400. The cruise must be taken prior to the end of 2014. The 4-Night Disney Cruise is not the only prize you can win. One winner will receive a $500 Disney Store shopping card which will be redeemable online at DisneyStore.com and at participating retail Disney Store locations. Twenty-Five second place winners will each receive the Little Mermaid Home Prize Pack, which includes a Transforming Fashion Doll from Mattel, 2 Pack Storage Cubes from Idea Nuova, and a Little Mermaid “Shimmer and Gleam” Hand Towel and Bath Towel from Jay Franco and a Little Mermaid Comforter and Sheet set from Franco Manufacturing. The estimated value is about $120. Twenty-Five second place winners will each receive the Little Mermaid Toy Prize Pack valued around $100. The toy prize pack includes a Little Mermaid Acoustic Guitar from First Act, a Little Mermaid Star of the Sea MP3 Microphone from KidDesigns, an Under The Sea Surprise Ariel doll from TollyTots and Ariel’s Floating Fountain Playset from Mattel. Twenty-Five second place winners will each receive the Little Mermaid Home Prize Pack, which includes a 16 oz. Little Mermaid Tervis Tumbler, A Plate, Bowl and Pull Top Bottle from ZAK! Designs, A Little Mermaid Rolling Art Desk and a Little Mermaid Color N Style Fashion Purse Activity from Tara Toys, and an Ariel Backpack and Lunch Kit from Fast Forward The estimated value is a little over $95. To enter the Little Mermaid Adventure at Sea Sweepstakes log into your Disney Movie Rewards account, or create a free account. If you are not familiar with the Disney Movie Rewards program, and you frequently buy Disney Movies & Disney CDs, or see Disney movies in the theater you need to check it out. By entering a code found in the Blu-ray/DVD or taking a photo of your movie tickets you will earn reward points which are redeemable for various merchandise. This past December I was able to redeem 6000 Disney Movie Reward points for the Pirates of the Caribbean Four-Movie Blu-ray • DVD • Digital Copy Collection! Once you are logged in click on the Sweepstakes tab and look for the the sweepstakes banner featuring the Disney Dream. Disney Movie Rewards members will get one entry, but you will be able to redeem DMR points for up to 99 additional entries. Each additional entry will deduct 5 DMR points from your account. The sweepstakes is open to Disney Movie Rewards members, 13 years or older and who are legal residents of the United State, Puerto Rico and Canada. 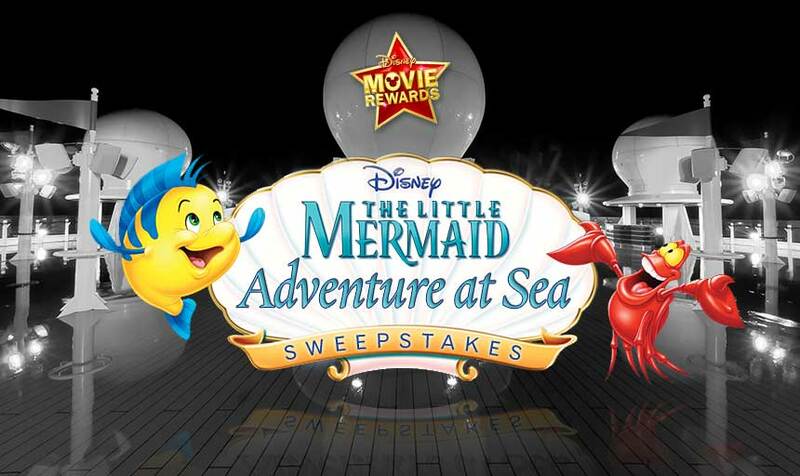 The Little Mermaid Adventure At Sea Sweepstakes ends on January 31, 2014, with a winner selected around February 14, 2014. For more fine print, click over to the official rules. This is not the only opportunity for you to enter to win a Disney Cruise. Disney Cruise Line is currently running the Catch Stitch! Sweepstakes for a chance to win a 7-Night Caribbean cruise on the Disney Fantasy. Good luck!